It is disappointing they did not advise newsagents direct and that they did not offer newsagents the same supply model they have apparently offered hobby shops. Does AME have access to locations where their magazine was selling. If yes they may conclude no newsagency is worth supplying direct. But I suspect not, Xchangit not fit for purpose? My understanding is publishers can access location based sales data. They aren’t the only one. I believe there may be a second model based mag going the same way (ie specialist hobby shops and direct subscription). s income… Call the Plumber…it’s all going down the toilet but Fletch says it’s not fair…. You said the G&G monopoly was going to be a good thing and that David Hogan was the right man for the job… more fake news! Take your bitterness somewhere else Ken. If you are correct, why do I continue to receive increasing numbers of none selling titles. Xchangit is a rort. Colin I suspect it is because Gotch is required to distribute what they are sent. Publishers control their print runs. Often, advertising is sold on the basis of print run size. Magazine distribution in Australia is a 3-entity process (Newsagents, Distributors, Publishers) so why are Publishers excluded from XchangeIT? All that said “Australian Model Engineering” have been unfair and unreasonable to infer that Newsagents are responsible for the cost burden. They have not mentioned Distributors at all. Regardless of whether they meant to or not we still have our customers venting at us, as if its our fault. 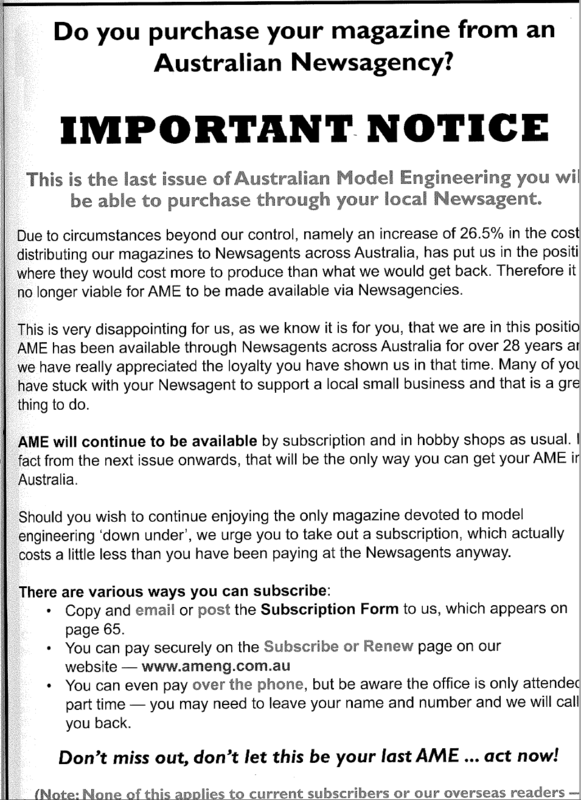 “Australian Model Engineering” is a low act entity as far as I am concerned. Correct me if I’m wrong but “…an increase of 26.5% to distribute our magazines…” suggests the Distributor is responsible for the cost burden, not Newsagents. @Australian Family Tree I am correcting you because you are wrong (as you requested). There is absolutely no mention of Distributor in the article. You need to take a realistic look at the context. 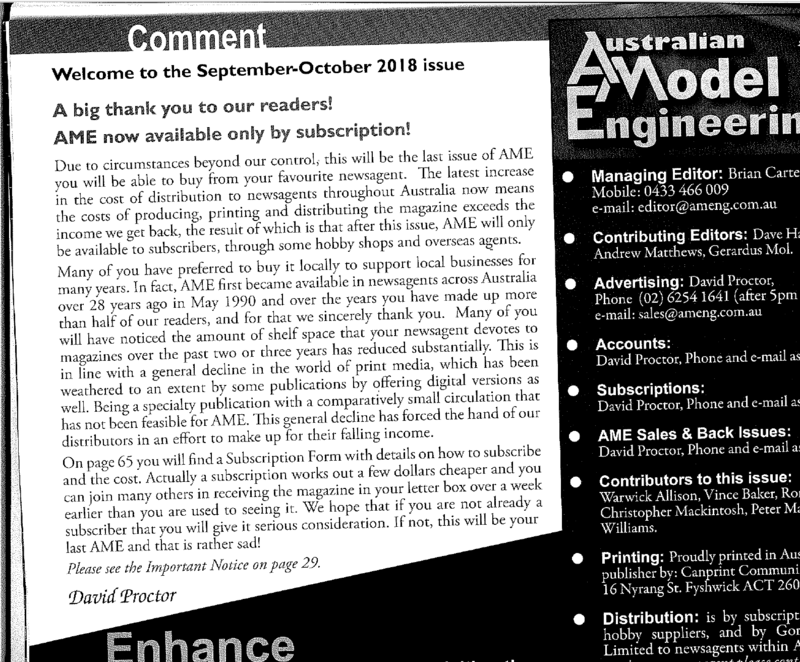 Hi Kevin, the first paragraph of AME’s explanation for its decision cites “an increase of 26.5% to distribute our magazines”. That refers to the fee Distributors charge Publishers to distribute their magazines to Newsagencies. So, yes, the Distributor is mentioned. How would a Publisher directly contact each Newsagency that sells their magazine when, in many instances, they are only given the Newsagent’s company or partnership name and not the store name? I am sorry but to the reader of your magazine who sees the comment “an increase of 26.5% to distribute our magazines” will interpret that as the Newsagent included. you could have said it better. Anyway – I have sent mine back as early return. Also, Mark is correct – you could have let Newsagents know if you had thought of that. Hi John, please note that AME is NOT my magazine. For the above reason, the statement “an increase of 26.5% to distribute our magazines” is crystal clear and relates solely to the Distribution fee, ie the Distributor. Nothing to do with Newsagents. So, once again — how would a Publisher directly contact each newsagency that sells their magazine when, in many instances, the Distributor only provides the Publisher with the Newsagent’s company or partnership name and not the actual Newsagency name? AME is easily found so it’s very easy for those Newsagents who wish to continue stocking AME for their customers to contact AME direct.